This month, February, is all about Accessibility. A broad term – that can mean so much and can be tackled many different ways. One thing’s for sure: we envision a future that is inclusive of and is accessible by all. There will always be room to improve experiences and products for more Canadians – and so, we want to know what you think with a solutions-oriented lens! As you learn digital skills and how to code with us throughout the month of February, we would like to challenge you to express your ideas, share your findings – perhaps articulate a solution on improving accessibility for a specific person, group, community or demographic. Design physical spaces for more people. Ex. Those with strollers or wheelchairs? 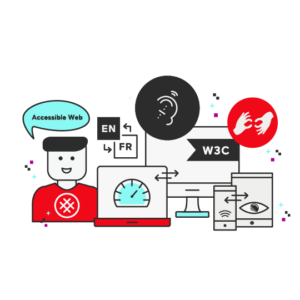 Help those who are visually impaired experience the web with ease? Support those with Parkinson’s experience every day tasks a bit easier? We will leave this up to you – and welcome you to be as imaginative and inventive as you like! We encourage you to put yourself in the shoes of someone who might have specific accessibility needs or connect with someone who might – to learn more! 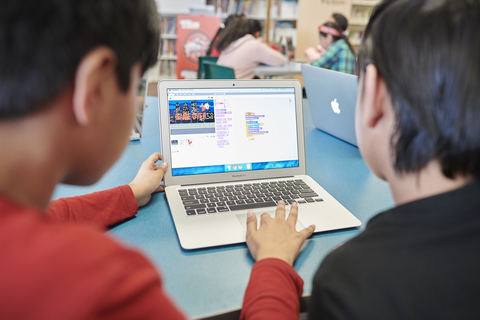 Share your projects using the #clcCode4Change hashtag! We want to see what you end up creating! 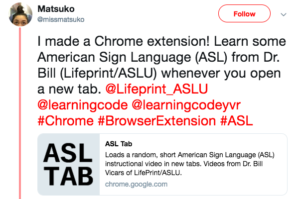 Learn about how learning how to code, inspired one learner to create a accessibility mobile application after witnessing a woman having difficulty with opening a door. Code can change the world. Each month, we’ve selected a different theme encouraging Canadians (like you!) to inspire your projects during our learning experiences.